While it can be frustrating to find that all trendy cuts and hairstyles pictured in magazines seem to be featured on models under twenty-five, this does not mean that mature women need to limit themselves to dated hairstyles reserved for ‘the older women’. On the contrary, many hairstyles which flatter more mature faces can be as trendy and attractive as any of those seen on the young. The key is understanding and working with your natural hair texture and colour and finding a good hair-stylist to work with you. In general, shorter hair is more flattering on older women. Of course, there are always exception to this rule (look at Jane Seymour) and provided your hair is thick and in good condition, there is no reason you cannot wear it long. In addition, in certain cultures, it is customary for women to have long hair, no matter what the age. However, most women over forty will look better with shorter hair – for example, shoulder length rather than waist length. Be warned, though, that it can be just as – if not more – unflattering to have hair that is cropped too short, as this can look too harsh and masculine on mature faces. Soft lines and fringes framing the face are much more flattering to older skin. It is important to use the right products and it pays to gain some knowledge in this area, whether through your own research (and trial and error) or through the advice of a trusted hair-stylist. One reason younger people tend to look like they have more attractive hairstyles is because they often have a better knowledge of the products required to achieve certain looks and how to use them. For example, it is better to use more mousse or gel to achieve fullness and control, than lots of hairspray. If you have fine hair, look for a spray shine designed for fine hair. Many modern styles require hair that is texturised so that it will not appear too heavy and you may need to try several products before you find one that works best with your hair type. What about colour?The key to youthful-looking hair is rich, shiny hair colour and to this end, if you decide to colour your hair, it is best to select a natural-looking shade which is close to your original hair colour. Choose a colour which brings out the natural glow of your skin – ask the advice of a good professional hair colourist to help you select the right shade. Remember, unless you were very blonde in your youth, it is generally not a good idea to go blonde. What if I have thinning hair? Hair naturally thins as we get older. However, the right haircut can make a world of difference to mature women with thin hair and there are now many tips and tricks for women to achieve the look of thick, healthy locks. Remember, there is a difference between thin hair and fine hair. The former refers to the amount of hair you have whereas the latter refers to the diameter of each hair strand on your head. You can have fine hair even if you have a large amount of hair on your head but the hardest combination is women who have fine hair that is also thin (ie. not very much hair). Various factors, such as stress, diet, various medications and age can have a great impact on how thick or thin your hair is. 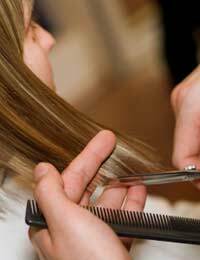 Several haircuts can help thin hair look thicker. The Bob, for example, has several variations which can suit different face shapes and hair textures. Long bobs are suitable for women with fuller faces whereas shorter bobs are ideal for women with narrow faces. The Chop is another that is good for women with thin hair. Similar in length to a Bob, however a Chop has ends which are not regular and therefore helps thin hair to appear thicker and full of body and shape. It also has the advantage of being very low maintenance. Another suitable hairstyle is the cap cut, which is ideal for women who are petite or have an oval-shaped face. It provides a lot of body without compromising on length. For women with very thin, fine hair, the crop can be ideal. This is any haircut that is short and tapered – however, this is quite a severe style and may not be suitable or flattering for every face shape. In fact, many women over the age of 45 find that although they could once wear a crop well, the style now draws too much attention to an unflattering chin and neckline. In particular, the crop draws a lot of attention to your eyes and this is one area of the face many older women may not wish to focus on. Finally a gentle, layered medium-length cut is a universally-flattering style for many women, whatever their age. One mistake not to repeat from your youth is over-styling your hair. Not only does over-styling, especially with heating implements, damage your already age-weakened hair but it is actually also more attractive to stop styling hair before it is perfect – this creates a more natural ‘messy’ look, which is also more youthful. Most of all – remember, hair that is in good condition is the vital ingredient to youthful, beautiful hair, no matter what the cut or hairstyle.